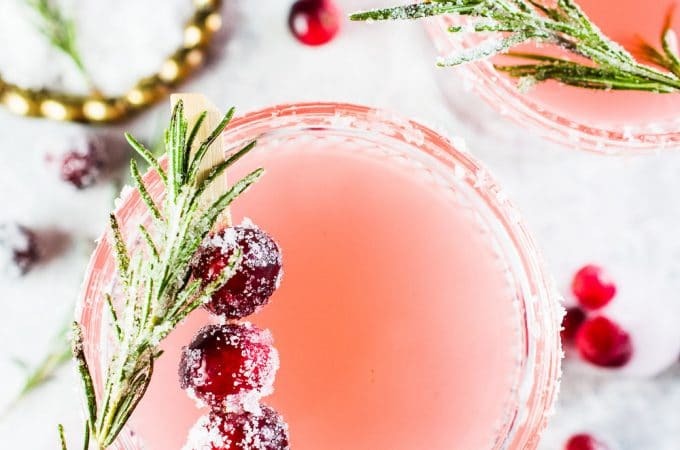 This pretty and delicious Cranberry Margarita is perfect for Christmas parties. 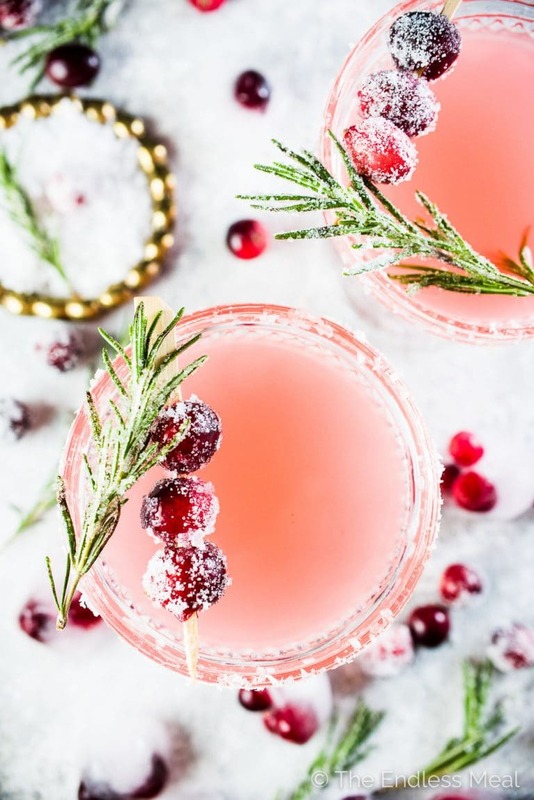 Cranberries are muddled with tequila, lime juice, and an easy to make rosemary simple syrup then shaken over ice. If you like margaritas you will love this cocktail! Tequila and Christmas together at last! And what took them so long to team up? They were meant for each other. We recipe tested a few versions of this cranberry margarita before nailing it with this one. Sidebar → Totally had an “I have the best job ever” moment after an afternoon of on the job margarita drinking. How did this suddenly become real life? Pinch me … or just pass me another marg. The part of this recipe that sent us back into the kitchen to retest a few times was the rosemary simple syrup. Rosemary can be such a strong flavor that I was worried about it being too powerful and taking over the cocktail. I was afraid of recreating that situation, so I went pretty easy on the rosemary the first two attempts. Too easy. Easy to the point of not tasting the rosemary. The rosemary syrup recipe we finally nailed is perfect. 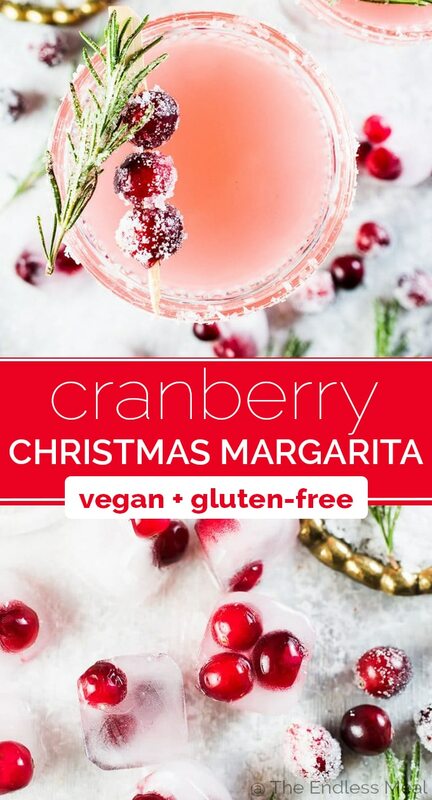 It adds a subtle (but definitely there) Christmas-y flavor that totally makes cranberry margarita. Whatever you do, don't skip it. 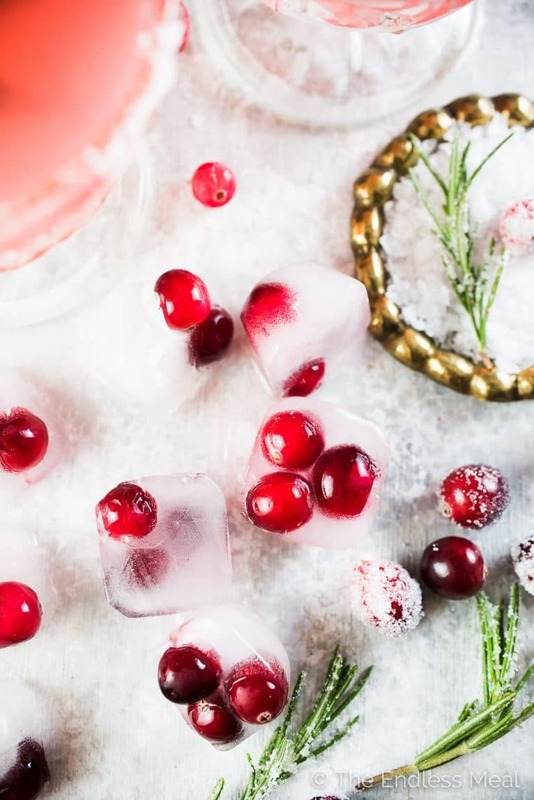 We need a moment for the cranberry ice cubes. Are they not the cutest things ever? Even a glass of water becomes fun with these little cubes cooling it down. I'm seriously in love. To make them, put a few cranberries in your ice cube tray, fill with water, and freeze. They're ridiculously easy to make and up the pretty factor of anything you're drinking. Not possible to pin fail this one! → Roll in sugar to make them look snowy. Pour some salt onto a plate. Run a cut lime around the rim of a glass. Dip the rim into the salt then set the glass aside. 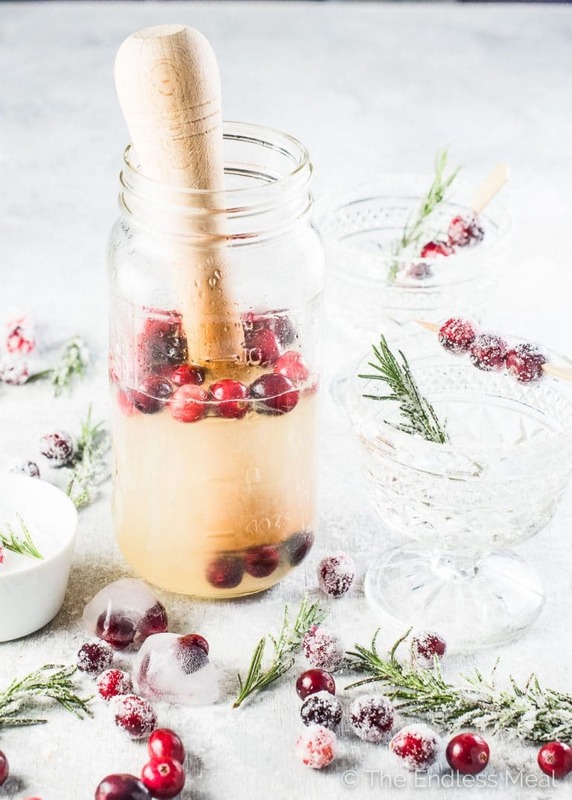 Add the tequila and thawed cranberries to a shaker or 1-liter mason jar. Muddle the cranberries until they have broken down and the tequila is pink. Add the simple syrup and lime juice to the shaker then top with ice. Stir until cold then strain into glasses. 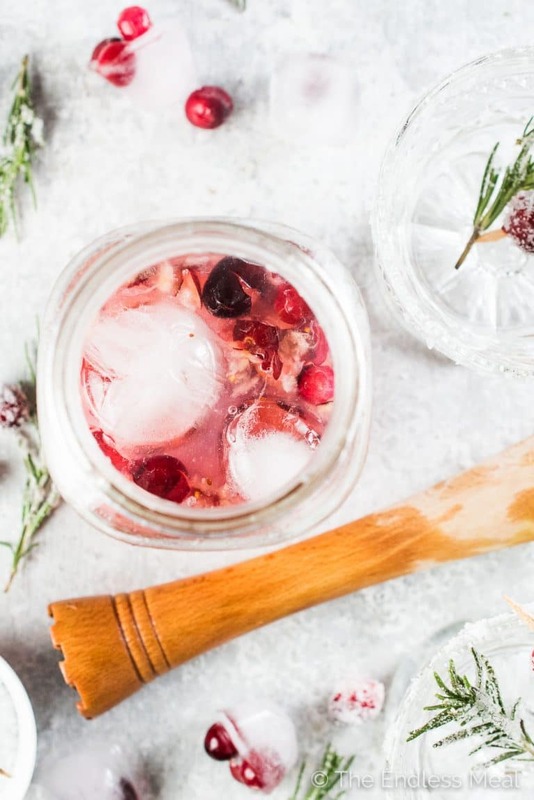 Garnish with sugared cranberries and rosemary. Bring the water, sugar, and rosemary to a boil in a small pot over high heat. Reduce the heat to medium and simmer for 5 minutes. Set aside to cool then strain the rosemary from the syrup. Store the syrup in your fridge for up to 2 weeks. Dip the cranberries and rosemary into some rosemary simple syrup then shake off the excess. Place some sugar in a small bowl then dip the wet cranberries and rosemary into the sugar. Set them aside on a parchment lined plate to dry. Is it fairly easy to make a huge batch of these(like a pitcher or more)? We are having a NYE party and I think I’m going to make this the signature drink. It’s super easy! I often make big batches of margaritas (this cranberry one and regular lime margarita, too) for parties. You can even pre-mix several big jugs and keep them in your fridge until you’re ready to serve them. I know it’s not Christmas but I found some cranberries in my freezer and wanted to use them. This was such a great recipe. The rosemary really takes it to the next level here. I’m happy I have a few cranberies left so I don’t have to wait unti the holidays to make this again! There’s never a wrong time of year for margaritas! !